(Nanowerk News) Nanotubes can be used for many things: electrical circuits, batteries, innovative fabrics and more. Scientists have noted, however, that nanotubes, whose structures appear similar, can actually exhibit different properties, with important consequences in their applications. Carbon nanotubes and boron nitride nanotubes, for example, while nearly indistinguishable in their structure, can be different when it comes to friction. A study conducted by SISSA/CNR-IOM and Tel Aviv University created computer models of these crystals and studied their characteristics in detail and observed differences related to the material’s chirality. 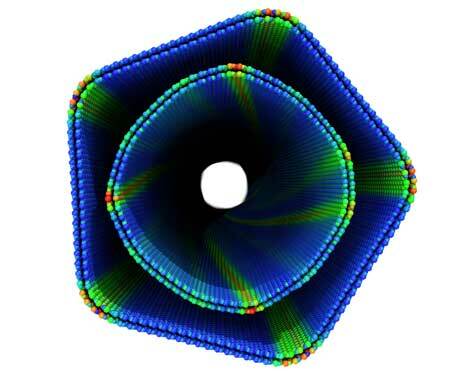 The study was published in Nature Nanotechnology ("Multiwalled nanotube faceting unravelled").